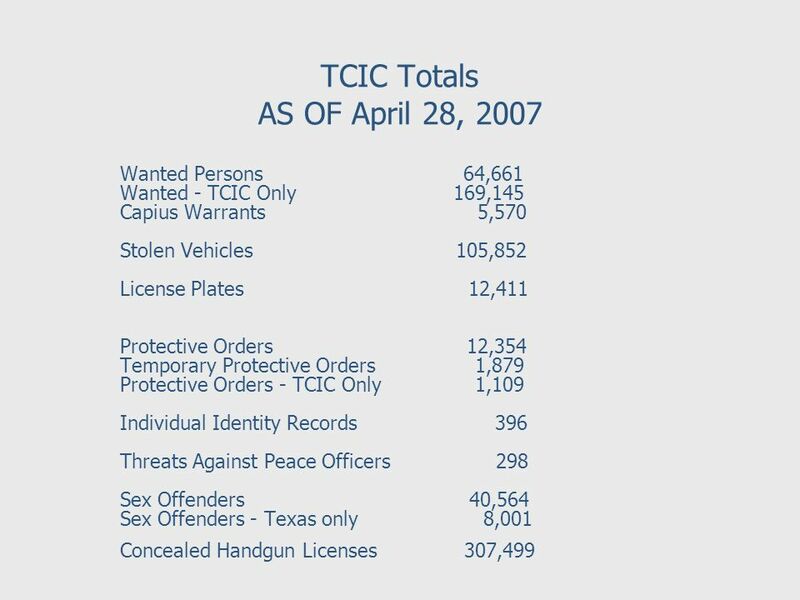 CRIME RECORDS SERVICE UPDATE Texas Department of Public Safety TCJIUG Galveston May 2008. 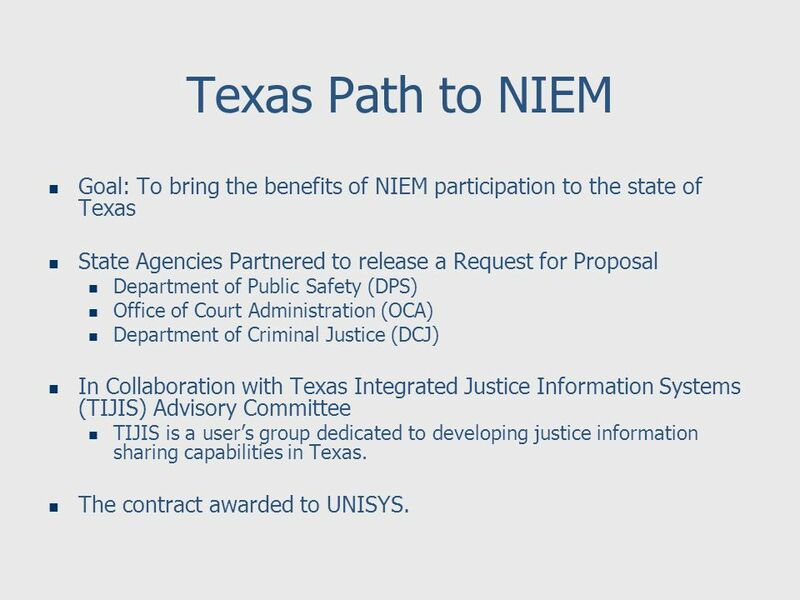 3 Texas Path to NIEM Goal: To bring the benefits of NIEM participation to the state of Texas State Agencies Partnered to release a Request for Proposal Department of Public Safety (DPS) Office of Court Administration (OCA) Department of Criminal Justice (DCJ) In Collaboration with Texas Integrated Justice Information Systems (TIJIS) Advisory Committee TIJIS is a users group dedicated to developing justice information sharing capabilities in Texas. The contract awarded to UNISYS. 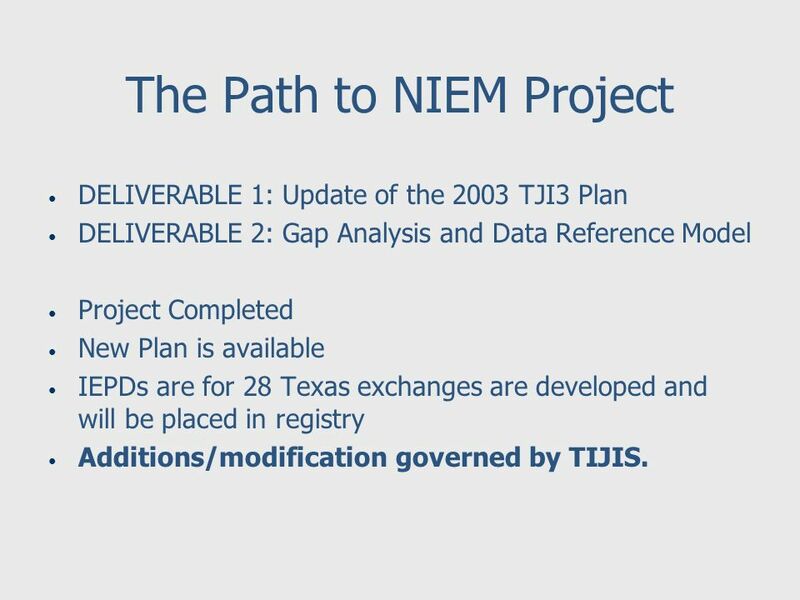 4 The Path to NIEM Project DELIVERABLE 1: Update of the 2003 TJI3 Plan DELIVERABLE 2: Gap Analysis and Data Reference Model Project Completed New Plan is available IEPDs are for 28 Texas exchanges are developed and will be placed in registry Additions/modification governed by TIJIS. 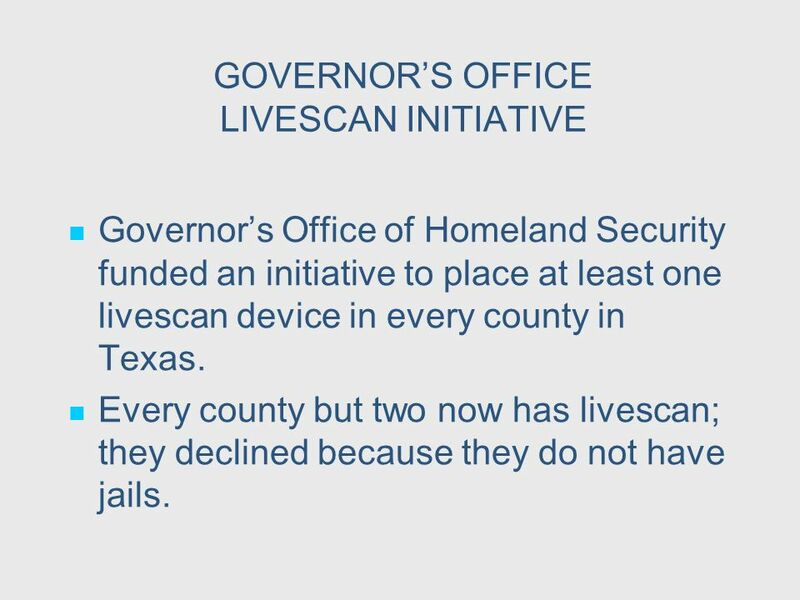 7 GOVERNORS OFFICE LIVESCAN INITIATIVE Governors Office of Homeland Security funded an initiative to place at least one livescan device in every county in Texas. 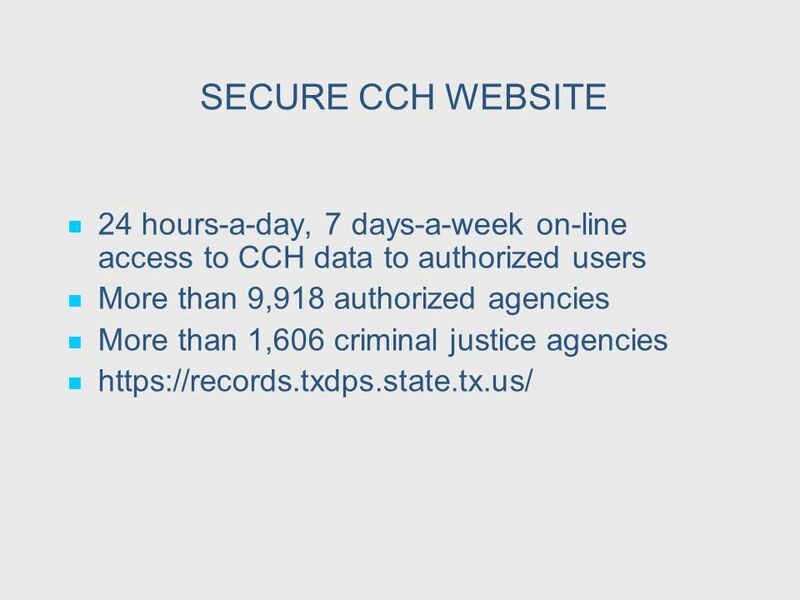 Every county but two now has livescan; they declined because they do not have jails. 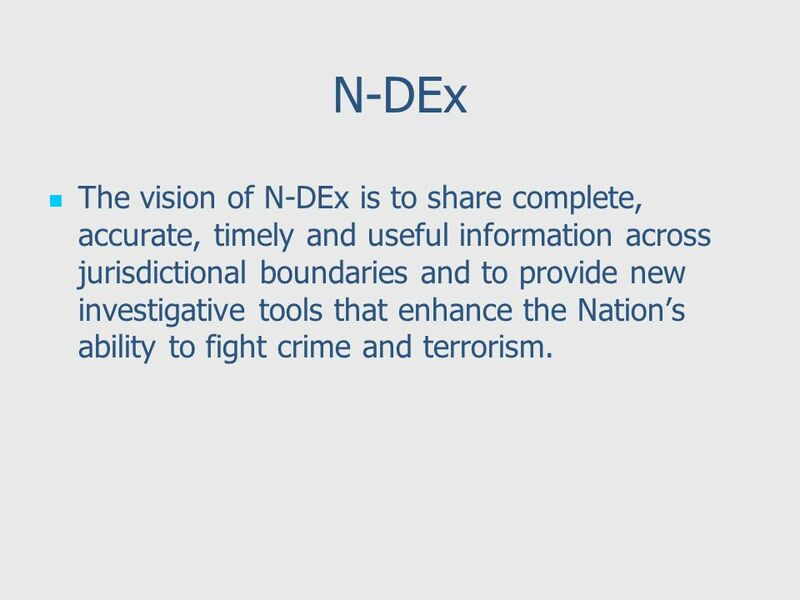 22 N-DEx The vision of N-DEx is to share complete, accurate, timely and useful information across jurisdictional boundaries and to provide new investigative tools that enhance the Nations ability to fight crime and terrorism. 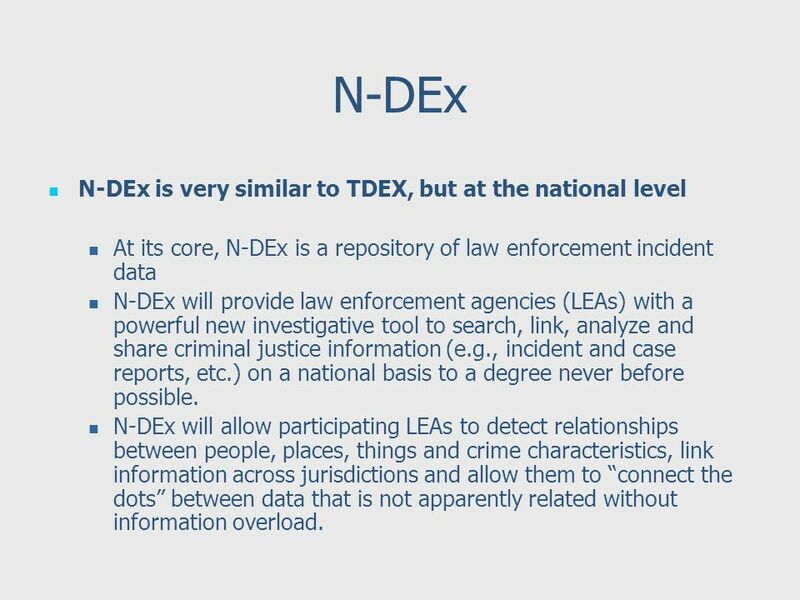 23 N-DEx N-DEx is very similar to TDEX, but at the national level At its core, N-DEx is a repository of law enforcement incident data N-DEx will provide law enforcement agencies (LEAs) with a powerful new investigative tool to search, link, analyze and share criminal justice information (e.g., incident and case reports, etc.) on a national basis to a degree never before possible. 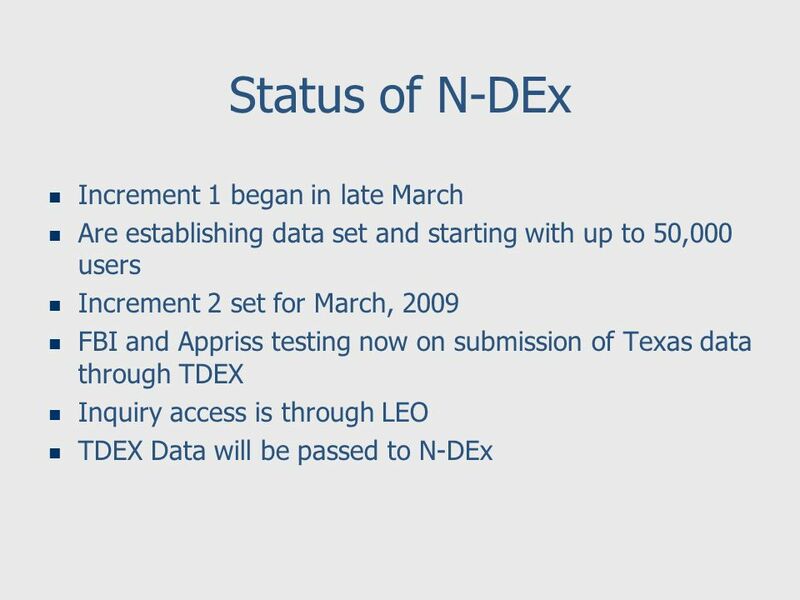 N-DEx will allow participating LEAs to detect relationships between people, places, things and crime characteristics, link information across jurisdictions and allow them to connect the dots between data that is not apparently related without information overload. 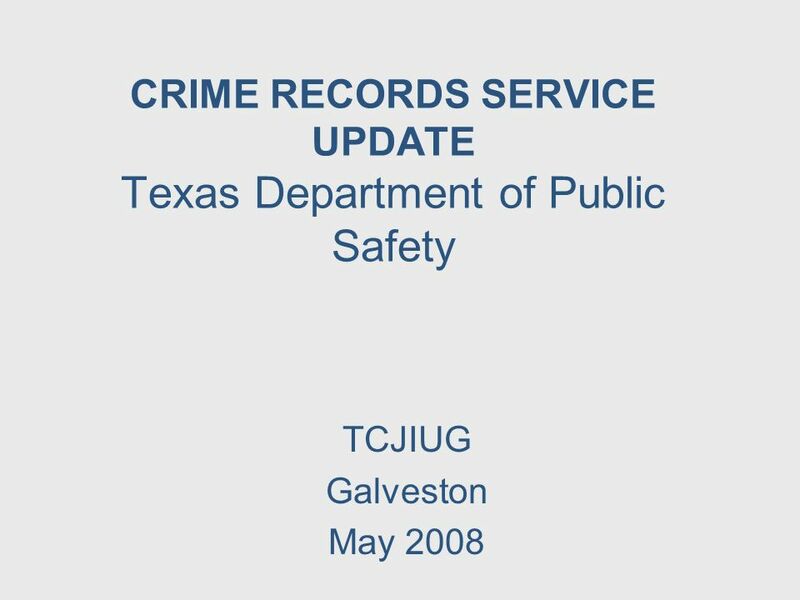 Download ppt "CRIME RECORDS SERVICE UPDATE Texas Department of Public Safety TCJIUG Galveston May 2008." 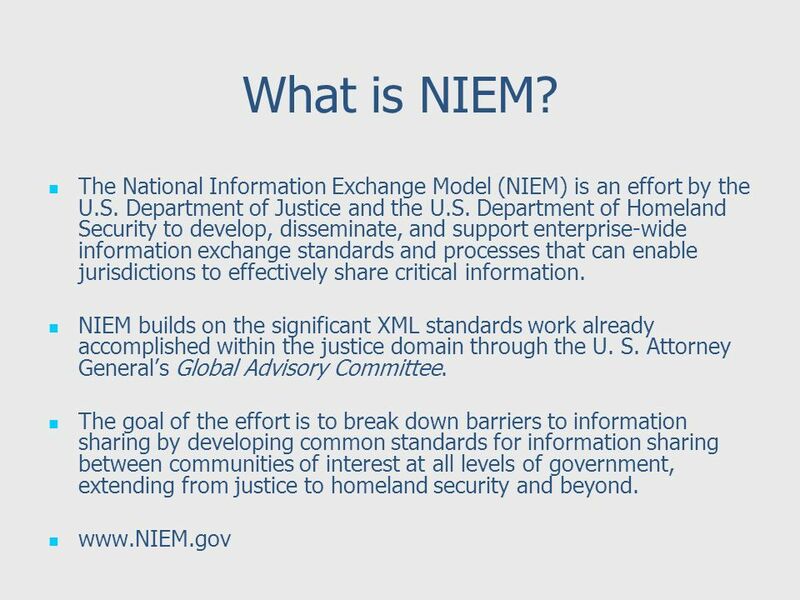 THE TEXAS PATH TO NIEM TCJIUG UPDATE Corpus Christi May 1, 2007. 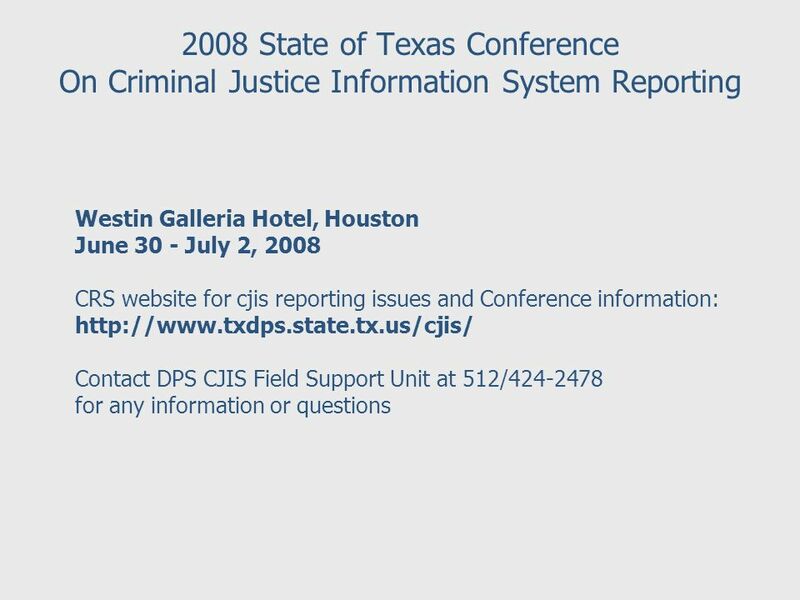 BULK CURRENCY INITIATIVE Texas Department of Public Safety Narcotics Service J. Pat OBurke, Deputy Commander 9/7/2006. 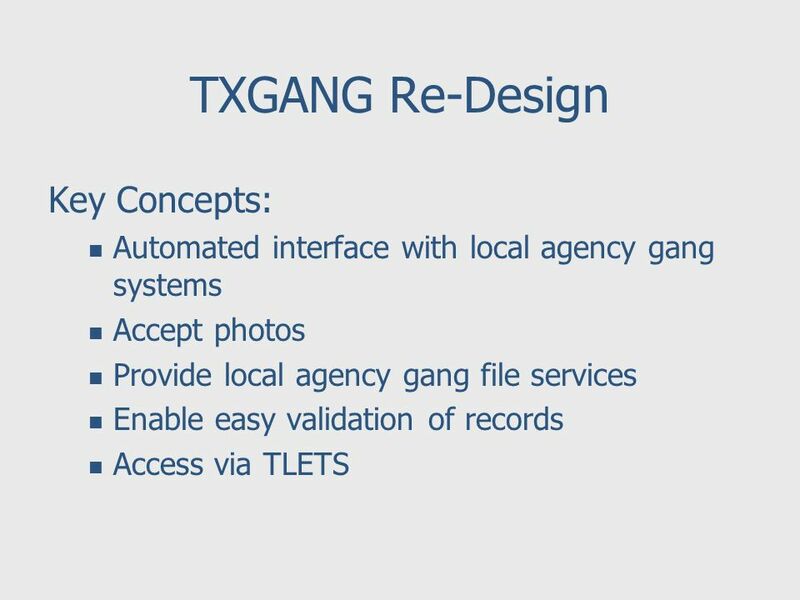 Integrated Justice Models Integrated Justice Models. 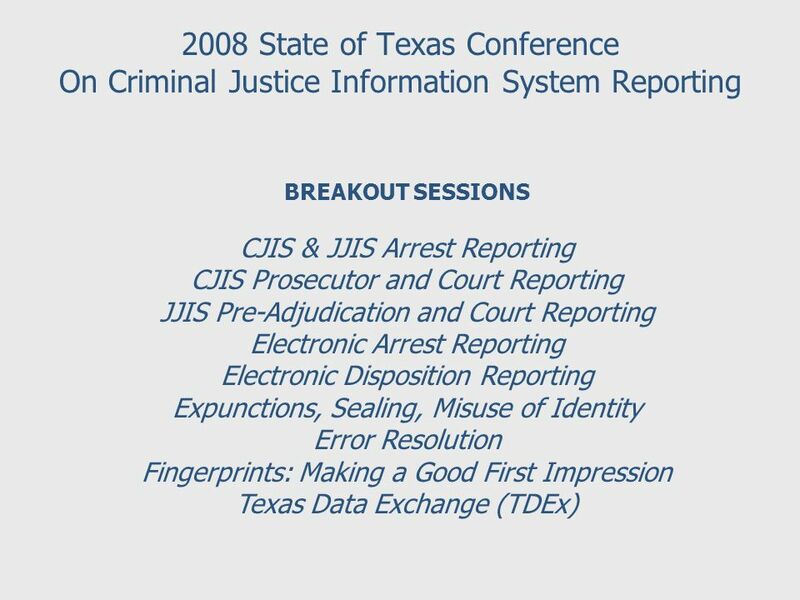 Integrated Justice Information Sharing: Critical Planning Issues David J. Roberts SEARCH Illinois Integrated Justice Information System Governing Board. Integrated Justice Information Sharing Illinois Integrated Justice Information System Implementation Board Meeting August 14, 2003. 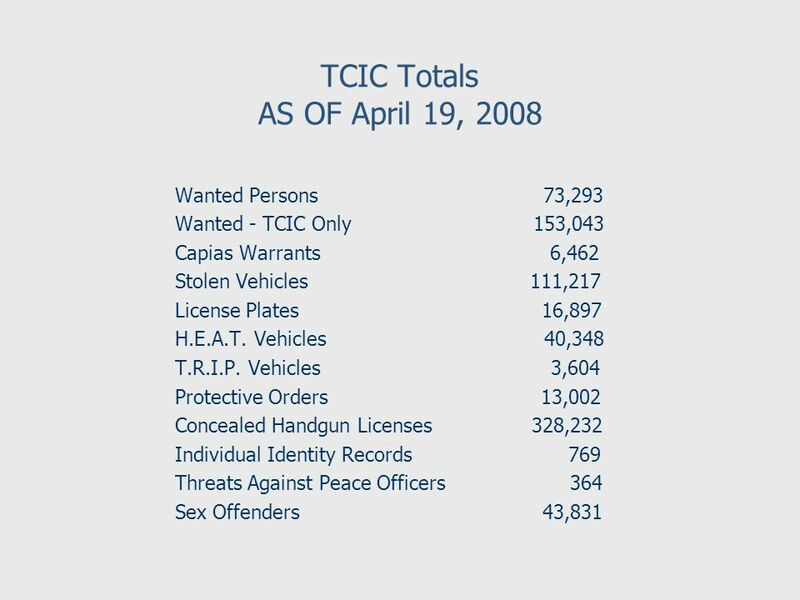 1 Florida Department of Corrections Presentations to the Senate Criminal Justice Committee Tuesday, December 11, 2007. 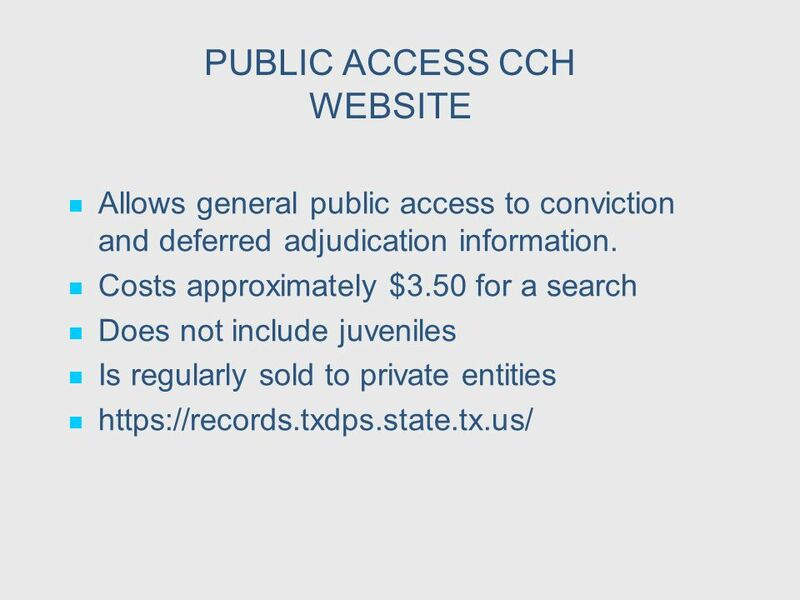 Access is defined as physical access: The ability to receive, view, or discuss the Criminal History Record Information (CHRI) regardless of retrieval method. 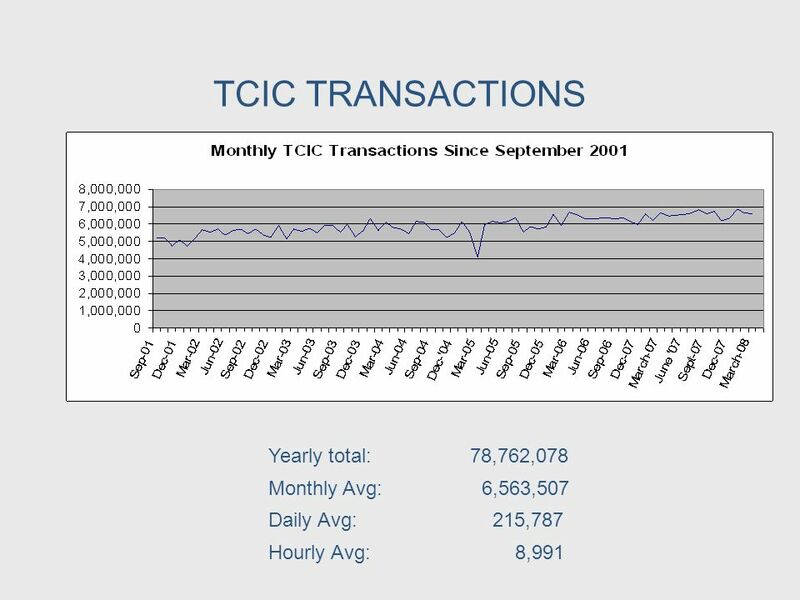 Vermont Criminal Information Center 103 South Main Street Waterbury, Vermont Subscription Service for Non- Criminal Justice Agencies Power Point. Pinal County, Arizona November 10, 2003 Pinal County, Arizona November 10, 2003. 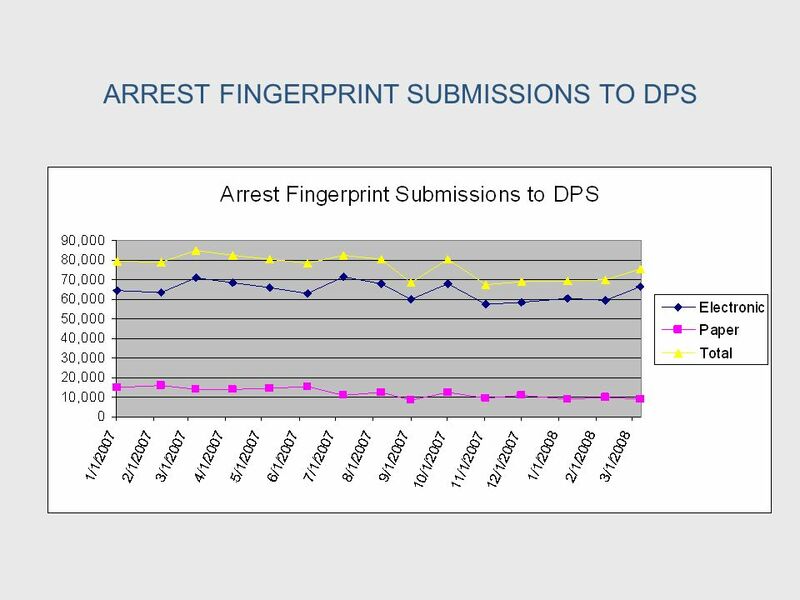 Indianapolis, Indiana Offender Notification Meetings. NMLETS Replacement Project. 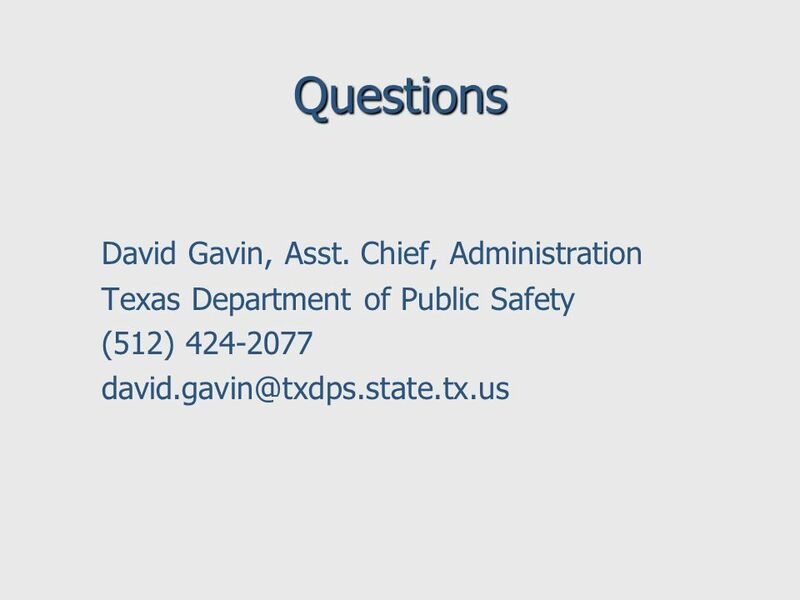 C2 funding - Laws of 2007, Chapter 28, Section 7, Item 030 Project Initiation Certification ($200,000) – 10/2007 Consultant. 1 Nevada Offense Code (NOC) Governance Model Presented by Scott Sosebee and Julie Butler Department of Public Safety and Administrative Office of the Courts. 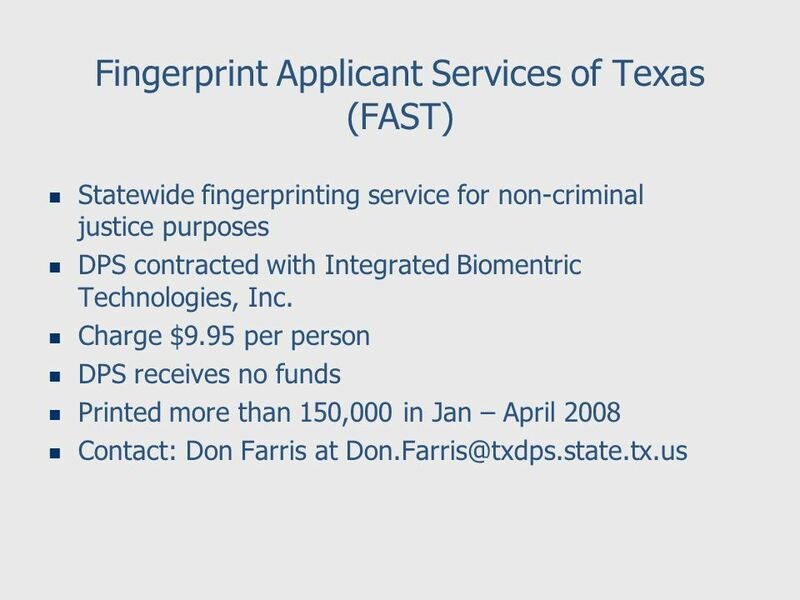 FBI* Fingerprint Checks A New Protection for Children Summer 2007 *Federal Bureau of Investigation. 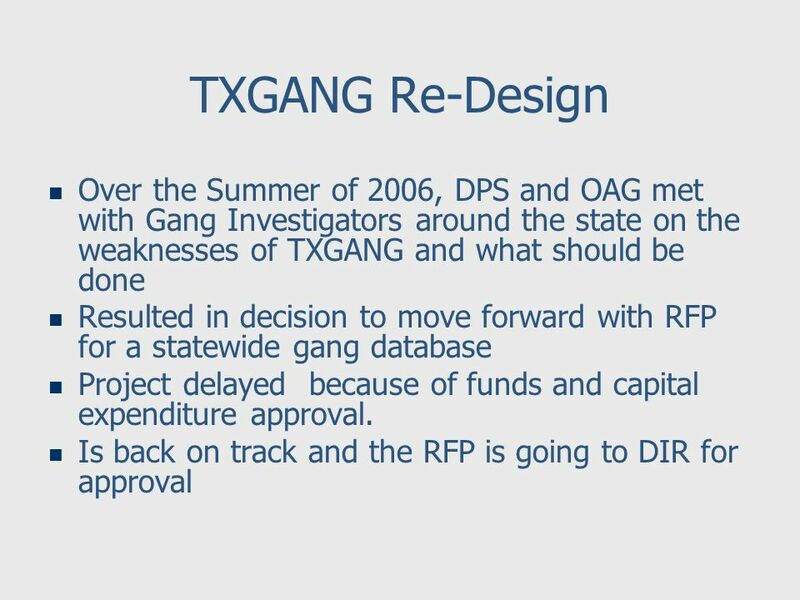 IOWAccess Project Request DPS Proposal Reports Online Project Missing Persons Information Clearinghouse (MPIC) May 11, 2005. October 5, 2011. 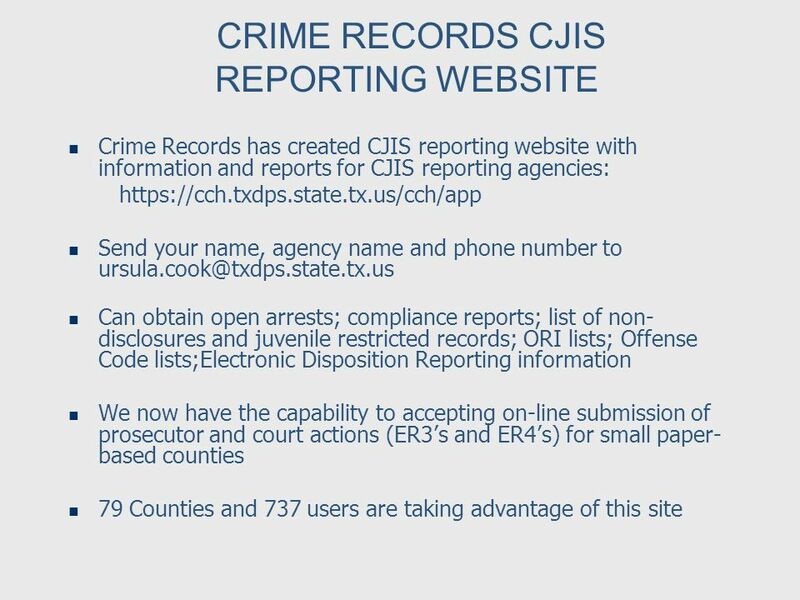 Central Repository - Responsibilities Law Enforcement Prosecutor Courts Collection and Dissemination 2,500,000+ Tenprints 20,000+ Latent.